The Salem Jail in 1692 was nothing like jails and prison today. The floor was covered in dirt and it was freezing in the winter and like a sauna in the summer. These were the conditions that accused witches had to live in while they waited for their trial. 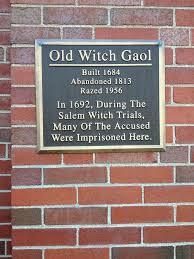 To make matters worse, the ‘witches’ were charged for room and board while they were incarcerated. When 75 year old widow, Ann Foster, died in jail while waiting for her trial her son had to pay all the expenses she incurred while being incarcerated before incarcerated body would be released to the family. Mary Bradbury was convicted of being a witch but her sentence was postponed and she was sent back to jail. As she was waiting to be hanged her husband bribed the jailer. Mary fled to Maine where she lived with her husband for a few years until things died down. Today the property that was once home to the Salem Jail is now home to government offices. However, strange things have been known to occur in the new building. Former employees claim to hear voices late at night and doors that were closed at the end of the day are found open in the morning. For more info on the Old Witch Gaol as well as over 30 other haunted locations check out the Salem Ghost Map in iTunes for only $1.99.